Guatemala volcano: At least 17 villages near the Volcan del Fuego, six miles from the colonial city of Antigua, are being evacuated. The eruption of the volcano could cause a disruption in airline flights in and out of Guatemala. Plumes of dark smoke rise from the Volcan de Fuego ( Volcano of Fire) as seen from Palin, south of Guatemala City, Thursday, Sept. 13, 2012. Officials are carrying out “a massive evacuation of thousands of people” in five communities. A long-simmering volcano outside one of the Guatemala's most famous tourist attractions exploded into a series of powerful eruptions Thursday, hurling thick clouds of ash nearly two miles (three kilometers) high, spewing rivers of lava down its flanks and forcing the evacuation of more than 33,000 people from surrounding communities. Guatemala's head of emergency evacuations, Sergio Cabanas, said the evacuees were leaving some 17 villages around the Volcan del Fuego, which sits about six miles southwest (16 kilometers) from the colonial city of Antigua. The ash was blowing south and authorities said Antigua was not currently in danger, although they expected the eruption to last for at least 12 more hours. The agency said the volcano spewed lava nearly 2,000 feet (600 meters) down slopes billowing with ash around Acatenango, a 12,346-foot-high (3,763-meter-high) volcano whose name translates as "Volcano of Fire." "A paroxysm of an eruption is taking place, a great volcanic eruption, with strong explosions and columns of ash," said Gustavo Chicna, a volcanologist with the National Institute of Seismology, Vulcanology, Meteorology and Hydrology. He said the cinders spewing from the volcano were settling a half-inch thick in many places. He said extremely hot gases were also rolling down the sides of the volcano, which was entirely wreathed in ash and smoke. The emergency agency warned that flights through the area could be affected. There was a general orange alert, the second-highest level, but a red alert south and southeast of the mountain, where, Chicna said, "it's almost in total darkness." Teresa Marroquin, disaster coordinator for the Guatemalan Red Cross, said the organization had set up 10 emergency shelters and was sending hygiene kits and water. "There are lots of respiratory problems and eye problems," she said. Interesting. I was just reading a couple days ago about how the lack of eruptions since Pinatubo has lowered sulphate particles in the air. This may mean a colder winter. We'll see. In the meantime, Italy looks like it is looking for geothermal power and might get more power than it bargained for. Drilling is underway at the site of a huge underground volcano near the Italian city of Naples, a few kilometres from Vesuvius. Scientists are looking for a chamber of molten rock believed to be located 3.5 km underground in the Campi Flegrei region. This type of volcanic land is known to be the origin of the strongest type of eruptions, capable of causing a level of destruction similar to that of a meteor striking earth. for these areas to erupt at their full capacity. Around three million people live in the Campi Flegrei region, which lies north west of Naples. Tungurahua continued to produce a sustained ash column rising 2-3 km and intermittent stronger explosions. Several pyroclastic flows occurred yesterday (at 05:00 am, 07:47 and 15:30 local time), the one at 07:47 reaching a length of up to 4 km distance near La Hacienda. The deposits of the flows were reported seen in the gorge and reaching the plain in the area between the Mandur and La Hacienda. The flow reached ​​grassland and burned the surrounding vegetation. THe other flows were confined to the upper slope of the volcano. Throughout the day, tremor and explosion signals were visible on the seismic recordings. More than 100 explosions of small to moderate size occurred, and accompanied by strong gunshot noises that rattled windows. The constantly raising ash column was reaching 2-3 km height and drifting to the northwest in the morning and later to the southwest and west, and later northeast. Ash fall occurred in Rio Verde, Banos, Runtún, Juive, Pondoa and El Manzano. Based on first analyses of samples of the ash deposit, IGEPN confirms that new magma has risen to the crater and is being erupted since the vent-clearing explosion on 14 Dec. The ash deposit is mostly 1 to 2 mm thick on average, gray and light cream in color and contains plagioclase crystals. The authorities in Argentina and Chile have issued an alert over increased activity at the Copahue volcano, which has begun spewing smoke and gas. Many residents have already left the area as a precaution. An orange volcano alert, the second highest, has been issued in both countries. The 3,000m (10,000ft) volcano is in Argentina's south-western Neuquen province, which borders the Biobio region of Chile. Ash has been raining down on the nearby villages of Copahue, Caviahue and Zapala. Residents who have stayed behind have been told to monitor the situation and be prepared to evacuate. Planes flying over the southern Andes have also been warned. The alerts are now RED the eruption is ongoing and strengthening, with the plume extending well into the Atlantic. Yet another volcano erupting on the "spine" of the Americas from southern Mexico into Chile. Quite a few (at least eight) now in minor to moderate eruption. They could all get quiet tomorrow, (Copahue is back to ORANGE) but it feels to me like a pot starting to simmer. Anybody heard anything about this? I generally place little faith in this website, but I must confess that, living on the east coast, this headline got my attention. The seismic swarm continues with even increasing intensity, as to both the average magnitude and frequency of earthquakes, as well as amplitude of harmonic volcanic tremor which is oscillating between higher and lower phases. This might correspond to some sort of "stop and go" behavior of magma moving its way through new cracks in the lower crust beneath the island. 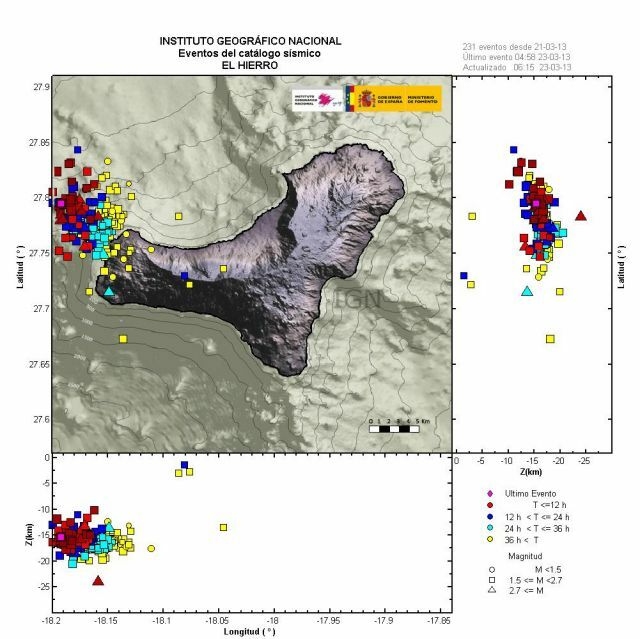 The location of the epicenters of quakes, the presumed location of the current magma intrusions, is now about 5 km NW of the western tip of the island, and at depths between 10-17 km. No strong upwards trend is yet visible, but this could change quickly. - Volcanic tremor continues, suggesting magma is still moving although mostly laterally for the time being to an area just north off the western tip of the island. - Earthquakes continue at high frequency and increasing magnitudes (more than 90 quakes above magnitude 2, including 8 of magnitudes 3-3.5 so far today). Their epicenters have remained at 14-16 km depth mostly, with some shallower events as well. - Deformation of the western part of the island continues to increase, with vertical uplift reaching about 5 cm on some stations in the westernmost part of the island. Cleveland Volcano explosions put air travel on alert: Who could be affected? Cleveland Volcano in Alaska's Aleutian Islands sits under the flight corridor between North America and Asia, but so far, its new ash cloud is not big enough to ground planes. Is Cleveland Volcano the next Eyjafjallajökull? In 2010, the tongue-twisting Icelandic volcano wreaked havoc on European air travel, stranding passengers for days as a massive ash plume grounded flights. On Saturday, another volcano in a remote corner of the world – Alaska's Cleveland Volcano – exploded three times in relatively quick succession, sending up its own ash cloud. Cleveland Volcano – like all the volcanoes in Alaska Aleutian island chain – sits beneath the flight corridor for jets passing between North America and Asia. That means it could disrupt intercontinental air travel just as Eyjafjallajökull did. But for now, scientists watching the event say the ash cloud has reached an altitude of only about 15,000 feet – well below the cruising altitude of commercial jetliners, which fly at about 35,000 feet. As of Sunday morning, there were no reported cancellations, though some flights were being routed farther north as a precaution, according to a Reuters report. Cleveland Volcano has been in a cycle of increased activity since 2011. Typically, brief outbursts have been followed by calm. But scientists can't be sure if this eruption will follow that pattern. The three quick explosions was unusual. "We haven't seen a phase like this where we've had multiple explosions," said Rick Wessels, a geophysicist at the US Geological Survey's Alaska Volcano Observatory, told Reuters. Part of the problem is that there is no seismic equipment on the 5,676-foot peak, forcing scientists to monitor it by satellite and with seismic equipment about 50 miles away. The Aleutians are a bleak and forbidding island chain extending southwest from the Alaskan mainland toward Russia. Cleveland is located on uninhabited Chuginadak Island. The nearest settlement, on an island about 45 miles away, is Nikolski, population 18. In all Alaska has more than 40 active volcanoes – accounting for 80 percent of the active volcanoes in the United States. The activity at Cleveland Volcano continues as an ongoing low-level eruption. The amplitude of the Cleveland infrasonic tremor, as measured by the ground-coupled airwaves on the nearby Okmok seismic network, 120 km (80 mi) to the northeast, is decreased from its peak activity yesterday evening. Satellite data show continuous low-level emissions of gas, steam, and minor amounts of ash over the past day with a faint plume extending eastward below 15,000 ft. Satellite data also continue to show highly elevated surface temperatures at the summit. Sudden explosions of blocks and ash are possible with little or no warning. Ash clouds, if produced, could exceed 20,000 feet above sea level. If a large ash-producing event occurs, nearby seismic, infrasound, or volcanic lightning networks should alert AVO staff quickly. However, for some events, a delay of several hours is possible. Cleveland Volcano does not have a local seismic network and is monitored using only distant seismic and infrasound instruments and satellite data. AVO will continue to monitor the volcano and issue additional information as available. Re: The Toba Memorial Volcano Thread - Yellowstone Restless?? The University of Utah, a YVO member agency, has sent out the following press release about a magnitude 3.6 earthquake that occurred amid three ongoing earthquake swarms in Yellowstone National Park. The current earthquake swarms are well within established norms for the Yellowstone region and the Yellowstone Volcano Observatory has determined that they present no volcanic hazard. The Yellowstone Volcano Observatory (YVO) provides long-term monitoring of volcanic and earthquake activity in the Yellowstone National Park region. Yellowstone is the site of the largest and most diverse collection of natural thermal features in the world and the first National Park. YVO is one of the five USGS Volcano Observatories that monitor volcanoes within the United States for science and public safety. I'll try to contact Stormbringer. Stormbringer and I ran the longest Geo thread ever on Peak Oil during a Yellowstone Earthquake Swarm, it went over 100 pages. I'd love to get him back. As reported earlier, Pakistan and India were both shaken by a strong 7.8 magnitude earthquake with numerous aftershocks. While the damage and the casualties from the quake are not fully known yet although according to Raza news agency the latest death toll is at 45, one quite stunning development has emerged, quite literally, out of the sea. As Pakistani's The News reports, an entire island emerged off the country's Gwadar coast in the aftermath of the quake. "According to DIG Gwadar Moazzam Jah, the island's altitude is 20 to 40 feet and width around 100 feet. Talking to Geo news, the DIG said that the island emerged at a distance of 350 feet in the sea from the Gwadar coast." We hope this is not some very elaborate mass media hoax. On the Gwadar coastline, the quake created a small island about half a mile into the sea near an area called ‘Jhanda’, according to Express News. The newly appearing island is said to have a mountainous terrain rising up to a hundred feet. A large crowd was seen gathering at the site to see the new island. What is curious is that the shocking formation is quite close to the border with Iran, and in close proximity to the Gulf of Oman, best known as the favorite anchoring spot of US Aircraft Carriers patrolling the Straits of Hormuz. How long until US military claims this new rock as a new naval base which just happens to be in close proximity to Iran's eastern maritime border? The earthquake was so powerful that it caused the seabed to rise and create a small, mountain-like island about 600 meters (yards) off Pakistan's Gwadar coastline in the Arabian Sea. Television channels showed images of a stretch of rocky terrain rising above the sea level, with a crowd of bewildered people gathering on the shore to witness the rare phenomenon. Indonesian Mount Sinabung volcano claimed its first victims due to a direct effect of the eruption. At least 14 people were reported killed and 3 others severely burnt by one or two moderately large pyroclastic flows this morning. 3 more people are still reported missing. As of Saturday evening (local time), the bodies of the 14 fatalities have all been transported from a number of areas in Suka Meriah village, which is located within a 3-kilometer radius of the volcano, while three others had yet to be found, Mt. Sinabung Eruption Media Center head Jhonson Tarigan told The Jakarta Post. During the past days, enforcement of the exclusion zone had been loosened, and according to some sources, people had even be formally allowed to return to their homes - a fatal decision for some. Among the fatalities were several school children and students. Rescue operations were affected by fears of new pyroclastic flows. According to BNPB spokesman Sutopo Purwo Nugroho, there were three eruptions: the first eruption occurred at 10:30 a.m. (local time) and lasted for eight-and-a-half-minutes, generating a 4.5 km long pyroclastic flow, while the second followed immediately after at 10:38 a.m. and lasted just over four minutes, followed by a third one at 11:27 a.m. for 84 seconds. This is the first direct impact of the Mt. Sinabung eruptions. Before the Saturday incident, the ongoing eruptions have already claimed the lives of 31 evacuees, as a result of various illnesses such as breathing difficulties, depression, asthma and hypertension. A new and intense episode of eruptive activity started at Tungurahua volcano, Ecuador, on February 1, 2014. A new paroxysm was observed along with a series of powerful vulcanian explosions. Ash plume surpassed 13 km (40 000 ft); eruption produced heavy tephra fall and pyroclastic flows up to 8 km in length. This intense activity was accompanied by a significant release of rubble that was earlier perceived in Pillate, Capil and Palictahua. Ash in areas surrounding the volcano caused total darkness in the Chacauco. Tungurahua started showing signs of increased activity from the early hours of last Thursday with explosions of moderate size and significant ash emissions.